Airlines was formed by Jim DeRogatis and John Tanzer -- who had played together opening for Wire in the tribute band the Ex-Lion Tamers -- and John Neilson, who met them at a show after interviewing the headliners. Taking a name from another favorite they all had in common, they came together as "Burning Airlines" in 1987. The first year saw them playing with a number of temporary lineups before things settled down with the arrival of guitarist/vocalist Jim Quinlan. This lineup's initial recording session resulted in a 5-song demo (they also took the opportunity to shorten the band name to "Airlines"). Four of the songs were ultimately released as two singles on the small Minneapolis label Susstones, Test and For Richard (written in honor of the brilliant oddball physicist Richard Feynman). Both of these records are long out of print, but you may still be able to find copies around if you look here. Airlines Mk.I played regularly around NYC and the east coast, and did one short tour to Chicago, Milwaukee, Minneapolis (shoutout to the 27 Various! ), and Iowa City ("it's not the end of the world, but you can see it from here"). Soon afterwards Jim DeRogatis left the band to expand his music journalism career and publish a book on the history of psychedelia, Kaleidoscope Eyes and a biography of seminal rock critic Lester Bangs, Let It Blurt. For a year or so the band carried on as a 3-piece with a drum machine, performing numerous shows and recording with Wharton Tiers at Fun City Studios. The only recordings to surface from this lineup appeared on a 3-song demo cassette. This lineup was responsible for the singles and CD that were eventually released on the Quixotic lable. In addition, the band racked up live appearances with Band Of Susans, Tall Dwarfs, Yo La Tengo, Babe The Blue Ox and a host of other acts, as well as airing live radio performances on WNYU, WFMU's Live Music Faucet, and NYC Public Access TV. 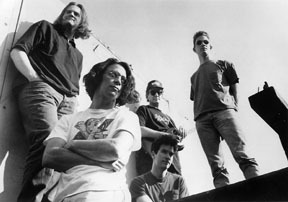 The band also contributed a scorching version of "Point That Thing Somewhere Else" to the Dark Beloved Cloud Clean tribute compilation, as well as recording a cover of the Fall's "Leave The Capitol" for an as-yet-unreleased Dark Beloved Cloud Fall tribute, "Dead Beat Descendents". Airlines eventually fragmented for good after the release of the self-titled CD. 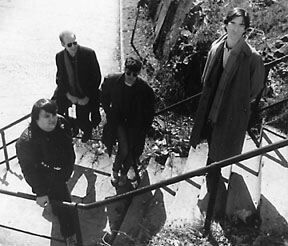 John Neilson and John Tanzer went on to play with the Wharton Tiers Ensemble and Glenn Branca. Tanzer also played in Nickel Hex with Joe Arcidiacono and Tom Kelley. Dave Roby left to spend more time on The Giant Mums, the Quixotic label, and the Upper Valley Psychedelic Continuum. There are entries for Airlines and the Giant Mums in the Trouser Press Guide To '90s Rock. Be sure to check out the Quixotic Records Airlines Page, recently updated with new pix and info! Rare live tracks on GoJohnnyGo blog. "Point That Thing Somewhere Else" - DBC Clean Tribute 7"
Syd Barrett - "Baby Lemonade"
Clean - "Point That Thing Somewhere Else"
Dome - "Rolling Upon My Day"
Dream Syndicate - "Then She Remembers"
Brian Eno - "Dead Finks Don't Talk"
Brian Eno - "Mother Whale Eyeless"
Fall - "Leave The Capitol"
Heptones - "Book Of Rules"
Pell Mell - "My Three Suns"
Pink Floyd - "Point Me At The Sky"
Velvet Underground - "Lady Godiva's Operation"
Ventures - "Walk, Don't Run '64"
"Beyond Music - Pure Radiance!"